The focus on the “European” or “extra-European” museum collections suggests that the world can be ordered according to regions. But the division of the world into “regions,” “cultural spheres,” or “ethnic representations,” is outmoded and is based all too often on colonial techniques of hegemonic order. Modern presentations of collections point to the commonality of history and on reciprocal influences – whether in the production or the presentation of objects. But how can the implicit Europe in the non-European collections be made visible? And what role can the demonstration of transcultural interrelationships play in the Humboldt-Forum? 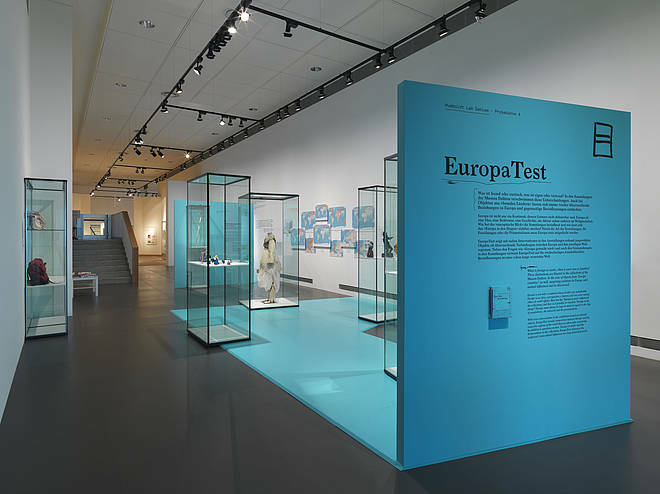 “EuropeTest” approached these questions with exhibition interventions in the Ethnologisches Museum and in the Museum für Asiatische Kunst. You can find a detailed description of the project here.